When you look at piece of Wisconsin countryside that has been fallow for many years and say, “That would be a great place to grow table grapes and dry them into raisins,” as we did a couple of years ago, you have put your foot on a path that will take you places you might not have imagined. 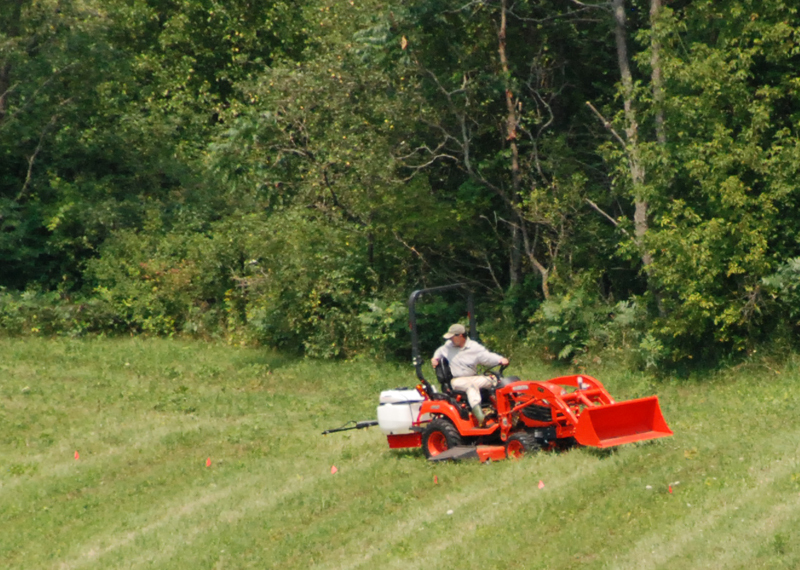 This past week, we sprayed herbicide on over an acre of our land. Even now, those words seem strange to write, but Denise and I think it is the best choice. Here’s why. The rigors and realities of coaxing seedless grapes to grow where for decades a fallow field has flourished requires suppressing competition from well-established plants – deeply- rooted invasives like wild parsnip and Canada thistle, sumac, assorted brambles fighting for light in thick stands of brome grass — the usual suspects that thrive in the rich soil of a sunny, south-facing slope in the Driftless Area. We’ve been getting to know these current residents well as we’ve mowed and hand-raked the whole area twice this summer (see our post Raking for Fun and Profit). If it were only a matter of preventing this year’s seeds from sprouting next spring, we could lightly till and plant the grassy paths and grape rows to create a vineyard. But the current residents would come charging back from their deep and robust roots, and overwhelm the grapes. You can’t grow great grapes like they are doing at the nearby Wollersheim Winery in a field of weeds. Deep plowing would break the perennial strangle hold, but that exposes more weed seeds to good growing conditions and disrupts the necessary microbial and fungal communities in the soil. It also makes the slope vulnerable to serious erosion. Covering ground with plastic sheets for a matter of months or years(!) can set back most plants and open up the area, but for a field of our size, that would be an intimidating amount of plastic to lay out and hold down, and when it was done – what then? A dumpster full of degrading plastic sheeting added to the landfill? We have become convinced that an appropriate application of Roundup is the most responsible and sustainable way to move this field into the local food shed. It’s a one-time application as opposed to the annual dosing that many farmers use in their ag operations. So exactly what is Roundup? 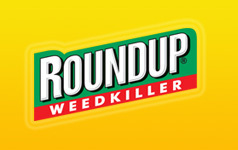 Developed in 1970 at Monsanto, Roundup is the trade name for glyphosate, which is a synthetic compound that gains its toxic punch by adding extra atomic structure to the natural amino acid glycine. Glyphosate kills plants and micro-organisms by interfering with the synthesis of three amino acids essential for the formation of normal proteins. Animals obtain these necessary amino acids through their diet, and therefore glyphosate doesn’t have the same effect in the animal kingdom. Human acute toxicity has only been reported in deliberate overdoses, and the EPA considers it to be non-carcinogenic. With herbicides, it’s easy to turn use into abuse. Although there is limited research on the effect of glyphosate on the natural bacteria in our human digestive system, the EPA also reports there are no adverse health effects from a diet derived entirely from glyphosate-sprayed fields at the maximum allowable levels. That’s probably reassuring to anyone in the habit of eating non-organic grocery store produce and processed foods, and in any event, no one will be eating anything from our field for the next four years. The scientific literature we’ve read indicates that glyphosate can be harmful but not as fatal to the essential mycorrhizal fungi in the soil, and we are hoping that our one-time use will allow the soil community to heal quickly. 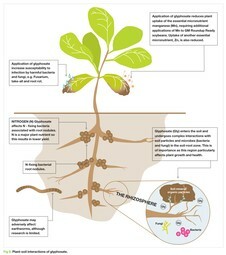 Perhaps because the mode of herbicidal action that kills plants comes from the spray being absorbed directly through the leaves and down into their roots, glyphosate appears to have less of an impact on fungi than on the target plants. Research indicates that glyphosate binds strongly to soil particles and begins to biodegrade with a typical field half-life of about 6 weeks, breaking down into less toxic components. 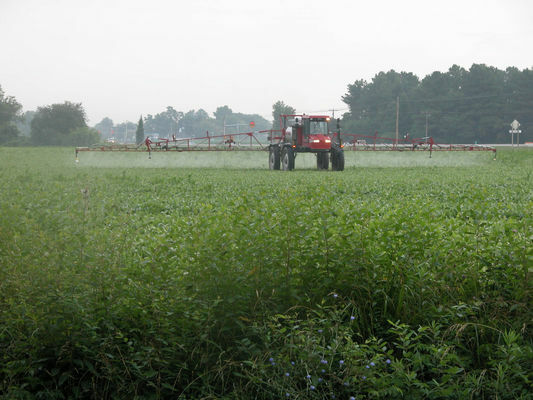 There is an ongoing debate about the highly toxic nature of “adjuvants” in herbicides — compounds that are added to the main ingredient, such as solvents for better spray delivery or other ingredients that provide longer-lasting effectiveness even if it rains. We picked a simple glyphosate with no additives and timed our application to avoid rain. Once our decision to spray was made, there were many considerations, calculations and assembly of equipment ahead. If we were going to do this, we wanted to do it right. We purchased and assembled a 40-gallon sprayer that mounts on the back of our tractor, using its 3-point hitch. With an electric pump, a 10-foot wide boom and 4 spray nozzles, it’s a tried and true delivery system. Everything seemed to be well-made, and the only thing missing was two hitch pins that I decided would ensure that the spring-loaded, expandable boom would stay open and operational in the field. We started by creating a grid across the entire field marked with flags that correspond to the 10-foot boom length. Next we filled the tank with water for a test run at a controlled speed of about 2 mph, evenly covering the entire 1.2-acre field, which includes both the half acre dedicated to future rows of grapes as well as the grassy aisles and avenues between and around the rows, and an area of land we plan to use to grow mulch for the vineyard and gardens. This calibration run gave us the data we needed to calculate the total volume of glyphosate solution we needed. After all the research, planning and assembly time, spraying the field took less than 2 hours. With calm winds and no rain predicted, it was idea conditions for minimizing spray drift and maximizing effectiveness. That was 8 days ago, and as of about 4 days ago we’ve been watching the plants, grasses and sumac shoots alike, slowly start to shrivel and die. This morning we walked out to assess the dead and dying vegetation with very mixed feelings. We have a remnant prairie just beyond the sprayed area, and it’s heartening to see it in good health. As we stood at the edge assessing our handiwork, a monarch butterfly landed on a clover flower. We’ll take that as a good omen that the healing process is about to begin, and healthier days are ahead for years to come in our newly converted agricultural field. Have you used herbicides on your property? Which ones do you use, and how have they worked? How do you feel about this toxic topic? We try to avoid using herbicides but part of our property was covered in Kudzu. We used enough herbicide to clear the areas we needed for yard and gardens. We currently use Killzall 2 herbicide at 1.5%. There are very few herbicides formulated to kill Kudzu. Herbicides are a tool and have their place when there is no other option. I would never use them to control weeds in the yard nor the garden. Fortunately for us, Kudzu is not a problem in Wisconsin, though I know its been a scourge further south for a long time. Sounds like another example of a one-time conversion use of herbicides. I totally agree with you about not using weed and feed products on the lawn or garden. One of the most commonly used herbicides for lawn braodleafs is 2,4-D. This was the active ingredient of Agent Orange used in Vietnam in the 60’s and 70’s. I can’t believe that people voluntarily use this stuff for cosmetic purposes around the house. Don’t get too hung up on roundup and beat yourself up over it. Your sensitive to it, that is a good conscience and valuable – do the best you can under the circumstances and move on. When you consider every action over time, which is more thoughtful than anybody looking on can imagine, tally up the score I bet you are doing a lot of good. That is my situation too. Thanks for your support. You’ve captured my sentiments as well. I’ve never used herbicide. I tried to make it some time ago when I was doing my degree in Chemistry, but never found the compound I was looking for – thank goodness. I understand the decisions you took. It can be so complicated and fighting weeds this year makes it all too tempting. I am trying to plan a new berry patch and trying to work out the best way to prepare that in an ecologically sensitive way is making my head hurt. Denise has shared so many of your thoughtful comments with me over time. I also was lured by the prospect of formulating herbicides long ago, after I got my degree. Like you, I am glad that I didn’t go down that “garden” path. Having made this one-time herbicide application on 1+ acres that we are converting from established grasses and weeds to productive vines and mulches, I don’t feel particularly sanguine about other uses, especially for smaller projects. Mechanical cultivation and mowing will continue to be my first choice using a tiller and mower, or even a hoe and a scythe where possible. Does smothering the prospective berry patch with a plastic sheet make sense to you? However you choose to prepare your new bed, we’ve been really impressed with how effective an annual rye smother crop can be at suppressing weeds in just one season. I prefer the black garden cloth version, rather than actually plastic (although it is probably still a plastic of some description). I think I might go that route because I can always re-use the cloth for other areas. Clover seems to do a good job of smothering and I wouldn’t have to remove all of that. Buckwheat also is usually a good crop to get rid of weeds. Not this year, but it was a weird growing year and even weeds took a long time to get going. The black cloth seems like a great idea. We’d like to try it in some smaller applications. Is there a particular type you use? Just the regular black garden fleece type of cloth in the local aladdin’s cave shop. There is probably better quality stuff available, but that means travelling and so we just use whatever they have in. You just lost all credibility using that crap! Jim, I would have agreed with you before I spent the past few years considering the options available to us in our setting and their consequences. Sustainability is not a one-size-fits-all proposition. I believe it’s more helpful to keep dialog and exploration alive while we try to find solutions that minimize degradation of our environment. Doug and I have concluded that the overall damage done by a one-time herbicide to prepare the ground for long-term grape production is justified. Over time, needing to burn less fossil fuels to carry food from other far-flung areas will hopefully outweigh the short-term damage to our ground. We are always learning, and would love to learn your alternative methods. I beg to differ. I admire your honesty Denise and Doug. The fact you have laid out your options so carefully does you credit. If only sustainability was an easy road to walk with clear ethical choices, then there would be no issues. Making tough choices is essential in walking the sustainable pathway and like you said, no one-size-fits-all. I hope that is the last time you have to take the route of Roundup and I am sure that you will be mighty pleased if that was the case.